Dogs and Bunnies! Living Together! Mass Hysteria! Over the weekend we had a visitor in the form of procyonid who just happened to be in the area visiting family. Since he had just come from "the con that shall not be named" he had his fursuit with him. I think he was looking for any opportunity to suit. Since he arrived late in the afternoon, guerrilla fursuiting options were limited. Fortunately for him, however, our neighbors were hanging their Xmas lights and their 2 young kids were helping. 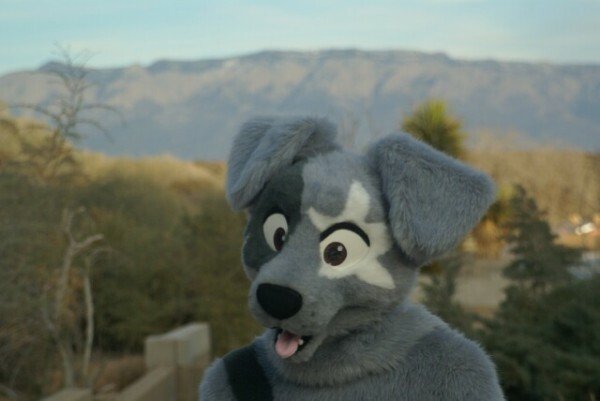 The one thing I love about Procyon is that he is this mild-mannered astronomy professor by day, but once you get him into fursuit, he immediately gets transformed into super happy bouncy puppy. He burst from our front door and immediately started running around the neighborhood. The neighbor's son, who is about 3, immediately fell in love with the big fuzzy character. His younger sister, unfortunately, not so much. Even their little dog loved frolicking with the big bouncy puppy. Their parents thought it was great and commented that it was good practice for the kids since there was a trip to Disneyland in the near future. This was their 1st time exposed to furry characters. Procyon wanted some pics in the desert environment, so I obliged to be photographer. 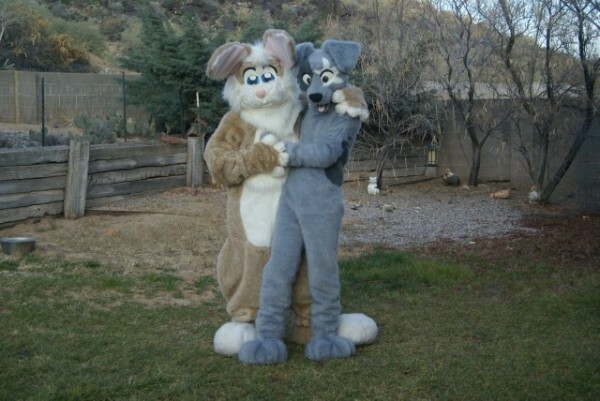 The fursuiting bug then became contagious, so I quickly hopped into Honey Bunny which just happened to be out at the time.